Offering You A full Line of Copper DIES to fit your business needs. From foil stamping to embossing, letter-pressing and intaglio printing, copper dies retain maximum heat and withstand the longest runs. OWOSSO offers a full range of magnesium dies for foil stamping, debossing, letterpress printing plates, and custom applications. 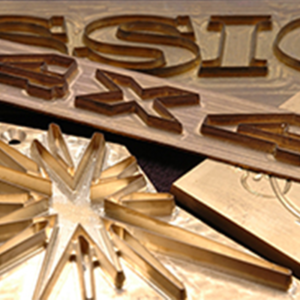 Brass dies for embossing, debossing, and combination foil embossing. Brass is a superior material for both machine work and hand sculpting, and is the best choice for combination foil stamping and embossing designs. As America’s largest brass, copper, and magnesium photoengraver, we have earned our extensive and loyal customer base by providing The Total Package – quality products, quick turn-around, competitive prices, friendly service, and a commitment to strong community values. We are also committed to using the most environmentally responsible practices in all of our manufacturing, disposal and recycling initiatives. Where We Live on the Etch!